James R: Seeing that I'm the member of the PCG without parental responsibilities or a weekend job, as with Daredevil, it was me who had the luxurious time to binge watch Jessica Jones last weekend. I'm fully aware that many people will be watching the show over a more prolonged period of time, so I shall keep this as spoiler-free as possible! The story of Jessica Jones starts off back in *gulp* 2001. The first issue of Brian Michael Bendis and Michael Gaydos' Alias marked a new era for mainstream comics. Following a very fallow period in the 1990s (along with bankruptcy) Marvel Comics were starting to publish some interesting titles under the stewardship of Bill Jemas, including the Spider Man anthology series Tangled Web and the introduction of the 'Ultimate' universe. In addition to these, Marvel introduced the 'MAX' line - it wasn't quite a Marvel version of Vertigo as the books under the MAX imprint used existing Marvel characters, but it was the publisher's first explicit acknowledgement that the readership of comics was mainly adult, and as much as those readers wanted the classic adventures of the Avengers and the Fantastic Four, they were also keen to see darker, more grown-up tales set within the Marvel Universe. Alias was remarkable when it was released. 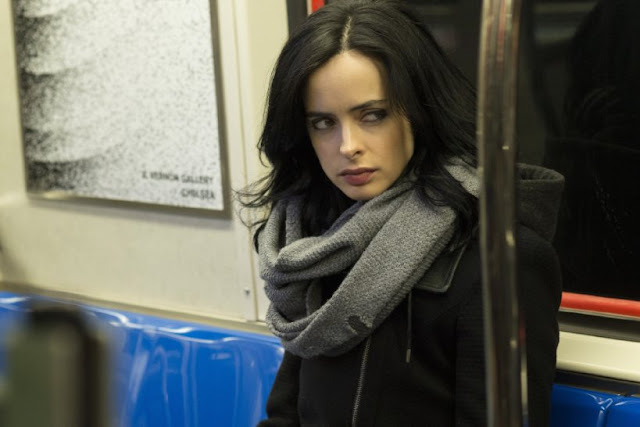 Its protagonist, Jessica Jones, was an immediately recognisable and relatable character. A former hero turned private eye, Jones had Captain Marvel Carol Danvers as her best friend, and her first stories saw her caught up in a case to expose Captain America's identity, a runaway mutant, Rick Jones and Mattie Franklin (the then Spider-Woman). The final arc revealed Jessica's past with Zebidiah Killgrave, the mind-controlling Purple Man. In the middle of all this, she dealt with a turbulent love life, from a disastrous relationship with Ant-Man Scott Lang, onto Luke Cage, with whom she started a family with. After 28 issues, it was done. 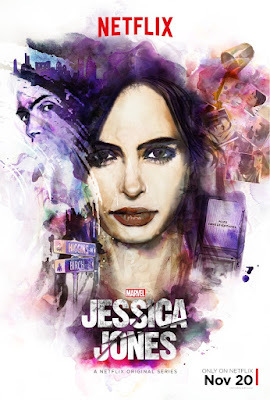 Jessica Jones became an integral part of the wider Marvel Universe as Bendis took over writing the Avengers, and the the tone struck by Alias - a more mature, darker take on superheroics - had become largely the norm. Jumping forward to 2015 and, of course, comics have become ubiquitous in pop culture. Largely driven by the success of Marvel's movies, it's incredible to look back at 2001 and see how far we've come. Marvel's choice to follow Daredevil with Jessica Jones is an obvious but shrewd move. Both are 'street level' stories, and both operate on the seedier side of New York (Jessica even worked for Matt Murdock in issue #15 of Alias). The series was always going to have to venture away from the original comic storylines - neither of the aforementioned Captains could make an appearance, and any mention of the Daily Bugle or the world of Spider-Man was always going to be off limits (at least for the moment). Instead, it's the book's final arc that becomes the core of the 13 episodes that debuted on Netflix last Friday. Having watched them all over the weekend, I can say that if you enjoyed Daredevil you'll find a lot to enjoy in Jessica Jones. It's not as ambitious as the first series of Hell's Kitchen's enforcer, but it's certainly worth your while. The main thing that the show gets right is the casting. Breaking Bad's Kirsten Ritter does a brilliant job of portraying Jessica Jones as a vulnerable and isolated hero. The other huge win for me was Mike Colter as Luke Cage. 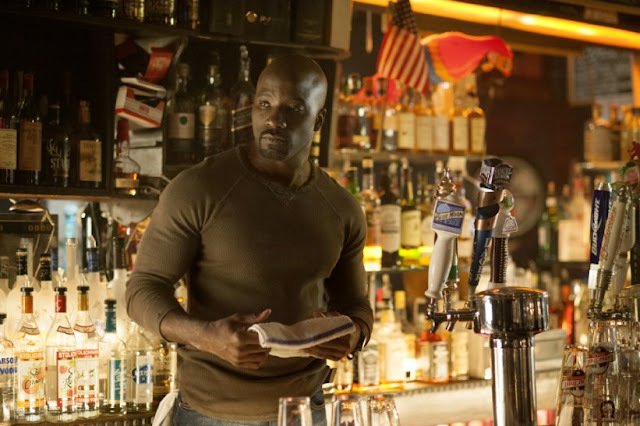 The chemistry between Colter and Ritter is great, and my favourite parts of the show were when they shared screen time (which augers very well for the future of the Marvel TV Universe and The Defenders). In the absence of Carol Danvers, having Trish Walker - Marvel's Hellcat - as Jessica's best friend was a nice touch, and their relationship developed well over the episodes. David Tennant is fine as Killgrave (with one 'L'), and even manages to illicit moments of sympathy for the villain, but it is a role most English actors could do in their sleep. As with Daredevil, Jessica Jones starts remarkably well as we're introduced to the P.I. and her world. The opening is a perfect retelling of the the first few pages of Alias #1, and it is true to the spirit of the comic book series. And, just like Daredevil, the season sags around the middle. Part of me wonders if the binge-watch is the best way to consume these shows. To hold up two of the finest TV series ever made in contrast - Mad Men and Breaking Bad - they broke up their final seasons. One reason was to give the creative teams the time necessary to construct great finales, but it also built up a wonderful sense of anticipation for each remaining episodes. With Daredevil and Jessica Jones, watching the episodes in 3-4 hour slabs takes away some of the magic - and sometimes the edges start to show. In the case of Jessica Jones, the biggest problem is there's not the narrative complexity of Daredevil. In that series, we had Matt's origin, the Hand, the Kingpin, Night Nurse, Karen Page, the Ben Urich stuff - there was plenty going on. In Jessica Jones, the Kilgrave storyline dominates, and whereas it's never boring, it could have done with a few more layers. It tries to develop a storyline highlighting how some people are reacting to the world post-Avengers, and whereas it was an interesting diversion, it never goes beyond that. The final episode was a mild let-down too - a couple of characters are given no resolution whatsoever, and rather than laying the foundations for what's to come, there's just a sense of resolution for Jessica and Trish. There's also a sense that too much stuff is neatly interlinked, and it feels forced rather than an organic part of the plot over 13 episodes. Great review. Totally agree this didn't stand up quite as well as DD even tho everyone in it was great... Plot let it down for me, bit too much circling around midway through.